If you need yet another reason to be depressed about the state of America’s public schools, keep reading. When state governments slash education budgets, there are very real consequences, and Louisiana has certainly found that out firsthand: Public schools across the state are still using the same hollowed-out history textbooks from 1970 to hold their classroom guns. 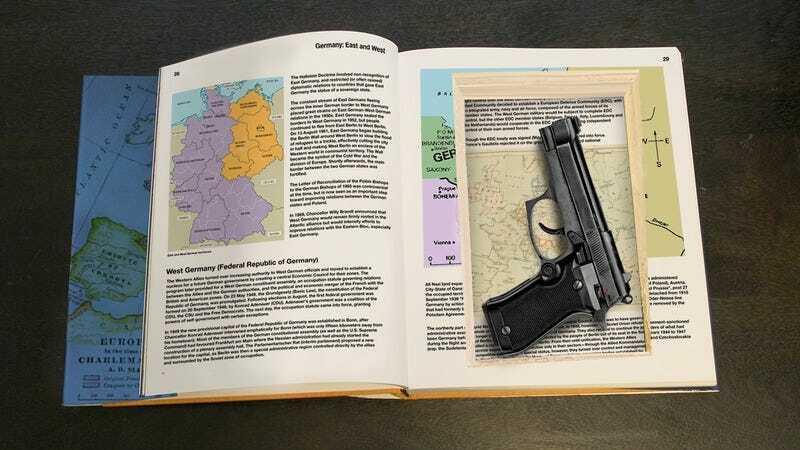 Can you imagine your son or daughter needing to reach for the classroom gun in a textbook that still thinks the Berlin Wall is a thing? This is the reality that the students in Louisiana classrooms have to deal with every day. These ancient books are falling apart, and teachers don’t have the budget to put guns inside textbooks that cover crucial topics like NAFTA. These teachers are forced to store their classroom guns in tattered books that talk about the Cold War as a current issue, and we can’t pretend that isn’t affecting our kids. So lawmakers, how about instead of another tax break for the rich, we make sure the textbooks Louisiana kids are using are more current than the guns being stored inside them? Seems pretty straightforward to us. When these books first came out, it made sense for teachers to keep guns in books that said Nixon was president. But this is 2017. Our kids, whether they be in Louisiana or anywhere else, deserve the very best, so we need to make sure that the jagged part of the page around the gun cutout discusses the impact of the internet on modern society when they are trying to stop the next Columbine. Until we do, the problem will only get worse with each passing year.